India Mars orbiter: Done for cheap. 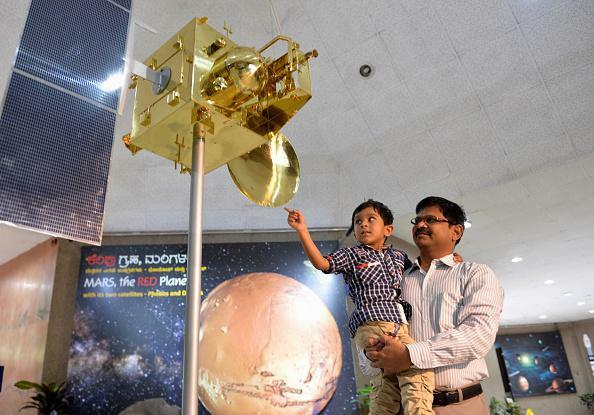 A father and son looking at a scale model of the orbiter in Bangalore. Children across India were asked to come to school by 6:45 a.m. Wednesday, well before the usual starting time, to watch the historic event on state television. The Mars Orbiter Mission, or MOM, was intended mostly to prove that India could succeed in such a highly technical endeavor — and to beat China. The mission’s success makes India the first country in the world to send a craft—called Mangalyaan, Hindi for “Mars craft”—to the planet on its first attempt. … Mr. Modi, who was elected in May with a once-in-a-generation majority in Parliament, has been on something of a roll. And the Mars achievement, which he had almost nothing to do with, will only add to that. Mr. Modi leaves Friday for New York, where he will address the United Nations General Assembly as well as a sold-out, largely Indian-American crowd at Madison Square Garden before heading to Washington for a meeting with President Obama. Hey, sometimes things just go your way. If I were Narendra Modi, I would sew a picture of the Mangalyaan on all my suits and start every public appearance with the Indian version of the “U-S-A! U-S-A!” chant for the next six months. Mangalyaan!